My Canon Elph digital camera died after too many years in my jersey's back pocket so let's turn our attention to Campagnolo's recent announcement. On the occassion of their 75th anniversay they are bringing back the SUPER RECORD name for their top gruppo. 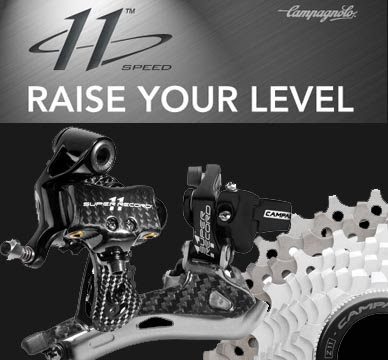 The bigger surprise was that Campagnolo, For Super Record, Record, and Chorus will be 11 speed groupsets. For 2009, Campagnolo is dividing its range into three distinct categories: the three 11-speed groupsets are deemed by Campagnolo to be for ‘Competition’, while those lower in the range – Centaur and Veloce – are designated for ‘Intense Use’ by people who may put in thousands of miles a year but don’t actually race. The lower groupsets in the range will remain at 10-speed but will share a number of the new design features of their Competition stablemates. Both will include the new shaped Ergopower levers, but with aluminium instead of carbon levers. Centaur will include an optional carbon chainset with the remainder in polished aluminium, while Veloce will be black anodised. Campagnolo’s entry-level Mirage and Xenon groupsets will be discontinued. "The 11-speed groupsets have been designed specifically with competitive aims in mind, with the sole purpose of providing the best possible performance for letting the world's top cyclists express all their potential without hesitation. Chorus, Record and Super Record: the same extremely high-performance technical solutions but using different materials. In all three cases there is only one objective: passing the finishing line first. 11 speed doesn't mean just a smaller sprocket to streak ahead downhill or a larger one for the toughest climbs: it is a new concept of groupset, completely reengineered in order to raise the level of performance. 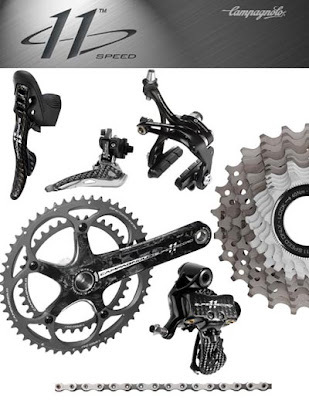 The 11 speed groupset have an higher level of efficiency, precision and quality of rear derailleur shifting and front derailleur shifting than the previous version 10s. Ergopower Ultra-shift 11s is more ergonomic and grants a more natural positions. Vari-Cushion™ hoods make it more comfortable: the hoods are softer in the hand support zones and harder where the fingers grip the control. The weight and the required operating force are lower thanks to the titanium and light alloy mechanism parts. The carbon fibre brake lever is lighter and more resistant to the fatigue. 11s Rear derailleur has been completely renewed: its 3G geometry makes him more rigid, more precise and faster. The oversize carbon fibre front plate grants a greater stability, stiffness and precision The increased stability of the sprockets etches also on the rear shiftng, which is faster. 11s Front derailleur has been designed to be more rigid, faster even under stress, and allow all the sprockets to be exploited. The Antifriction treatment: favours the chain upshifting and downshifting and reduces wear. The outer carbon fibre cage is compatible with the Standard and the Compact crankset. 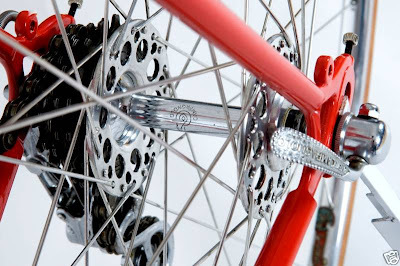 11s Crankset is more rigid, and shifts more quickly and fluidly even under stress. The new anti-wear surface treatment gives great duration with time. The new thoot design grants a singing upshifting and downshifting. The carbon fibre crank and the titanium sprokets allow a consistent reduction in weight. New entry for Super Record, which uses the ceramic bearings CULT for the maximum smoothness and resistance to corrosion. Ultra Torque technology and Q factor keep unchanged. 11s Sprocket set11s Sprocket set is composed of titanium sprocket and frames and aluminium ring, which reduce the weight and increase the resistance. The 11-speed sprocket set has been designed to be more rigid and shift more quickly even under stress. The new sprocket timing offers a faster and quieter shifting and less stress for the chain. The Nickel-Chrome surface treatment improve the resistance to wear and last but not least, the range of combination is broader (11-23, 11-25, 12-25, 12-27). 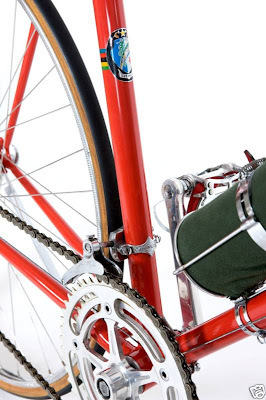 11s chain has been designed for shifting more rapidly and fluidly even under stress. The chain becomes thinner (5,9 to 5,5 mm) and lighter (hollow pins) but the 20% stronger thanks to the new special steel. 11s brakes are more rigid and lighter and produce a more powerful and progressive braking. They are differentiated as the previous version 10s, but the required operating force is lower thanks to the bearings. The Skeleton design holds steady and the titanium screws and nuts reduce the weight." 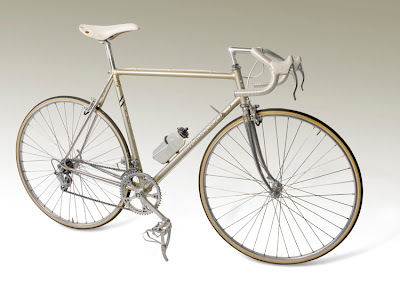 This 1958 De Rosa Corsa (restored) is being currently sold on ebay by a well known American collector. 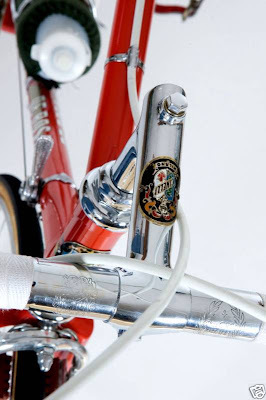 In his words, "One of the earliest known De Rosa’s, this cycle has been professionally restored to exact original specifications, in collaboration with Cristiano and Ugo De Rosa. Single stage, hand-rubbed enamel finish using original Azzuro paint (1950’s), exact varnish-fix decals and badges. Exceptional lug work, with finely shaped shorelines, thinned lug points and filletted valleys (see delicate curvature of top of headlug). Complete component kit is original to this cycle. 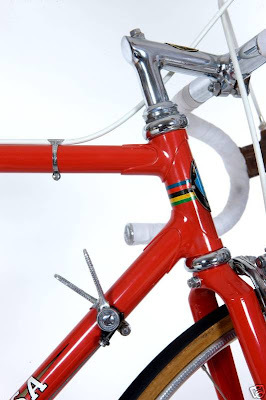 Constructed of Columbus tubing with Cinelli lugset, which De Rosa employed for only a year or two." 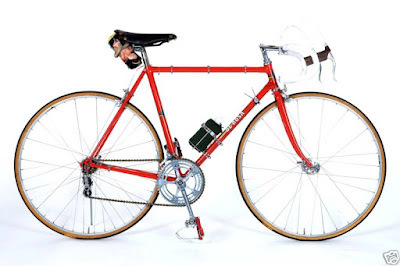 “Dear Mr. Kenneth, Mr. Ugo De Rosa check personally this bike and say that he build this bike end of 1958/59 .With My very best compliments of the exact restoration of this bike and good luck for you. -Campagnolo Gran Sport Hubs with early wing logo and curved Open "C" QR's. One of our cycling friends from Verona, Ester, squeezed in a visit to New Jersey last week while on a business trip. It was a lot of fun sightseeing, eating out, BBQs, mall shopping, strolling on country lanes, all while taking note of the differences between Italy and the United States (such as serving a slice of lemon curved around the edge of an espresso cup). Ester also brought me the new club jerseys, Grazie Mille! 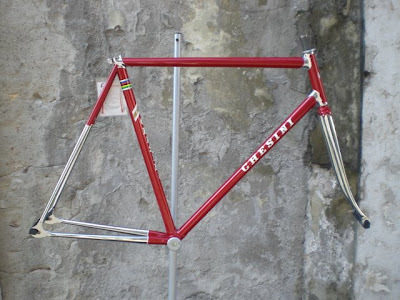 Blog reader "Pete" wrote saying, "I ordered the red Chesin track frame that you recently talked about. I just wanted to say thanks for posting the previous Chesini picts on your blog. I bought a Chesini Olympiade in 1986 from Cycles de Oro (in North Carolina). It is has always been my favorite bike and I still ride it regularly. 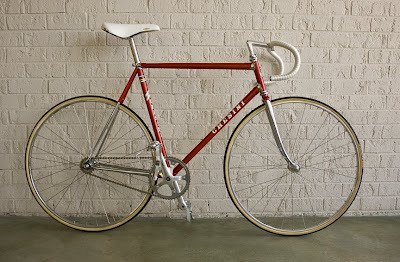 About six months ago I started looking into purchasing a handmade track bike. While discussing it with my wife I said I thought it would be great to have a Chesini track frame but thought it impossible. She googled "Chesini track frame" and your blog entry with the black and white frames came up. Shortly thereafter I contacted Paolo and made the order. He is very nice and made the whole process very enjoyable. So, thanks! Without your blog I would not have thought it was even a possibility" and, "It rides like a dream. I am sure I will enjoy this bike for years to come." Photos: Pete's 1986 ChesinI Olympiade, the new Chesini track frame in Verona upon completion, the Chesini in it's final build in the U.S.
Regretfully I didn't take more photos but we were moving at a pretty good clip all day. We did stop at the oldest covered bridge in New Jersey in Sergeantsville, the 1872 Green Sergeant's Covered Bridge spanning the rocky Wickecheoke Creek. .
From there is was a few miles to the Stockton Inn where we finished our ride. Burgers on a grill, cold beer, and a blues band awaited us. John knows how to plan things! Photos: at the covered bridge in Sergeantsville, we had covered 93 miles at this point; John takes over from the blues band to go through the quiz questions; the Stockton Inn offered a lovely setting for a ride finish. Photos: my Chesini INNOVATION, along Route 519, taking a breather, Marty (owner of Marty's Reliable Cycle) in Hope, NJ, where we stopped for a quick lunch break in Hope. Sunday, August 3rd, was the inaugural "Mystery History Tour", a Century (100 mile, 160.0 Km) bicycle ride the entire length of Route 519 from Greenville, New York to Stockton, New Jersey. This ride was a long held idea of John Kinsey and with the assistance of the staff Marty's Reliable Cycle (http://martysreliable.com/) it came to fruition. John also created a quiz and the person with the most correct answers at the finish won a prize. I wasn't paying too much attention to the quiz questions, mainly concentrated on turning the peddles over 4,600 feet of climbing and taking in the vistas as we passed one small village after another. Route 519 is aligned north-to-south along the western edge of New Jersey. Twenty one riders started and completed the ride on a beautiful day. In the photo above, L to R: Pete, Carlos, Susan, Marty, Johnnie, Jeff, TC, Patty, Angel, Joanne, Calvin, George, Jim, Kirk, Jay, John. Considerable planning was required since the riders and bikes had to be transported to Greenville, NY. Once we arrived in Stockton, NJ we would have to have transportation back home. Photos: a good homemade dinner the night before, pasta with basil pesto; the van gets loaded up, Joann is very worried that her carbon Cervelo Soloist will get dumped on top of all the other bikes, and I had to wear my Gruppo 1 jersey; most of the group organized for a photo in front of Marty's bike shop in Hackettstown.